Click the peppermint to load this page with thumbnails - high bandwidth! Manolo was kind enough to share his bezel with everyone. It's got the traditional MAME logo on top, but with a purple instead of blue tint, and a HotRod on the bottom left with the buttons labelled, and an instruction card on the bottom right. Artwork to create CD covers, created by Tadd. Tadd has this to say about it: This is for personal use only and should not be used for commerical gain or to distribute MAME in violation of the license (by including Roms). Otherwise, people can use/or modify them to suit their needs. Please heed his wishes in this regard. Thanks Tadd! Load your image and check it's size and resolution. 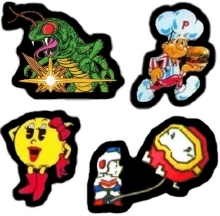 Arcade Paradise was kind enough to let us mirror some very nice arcade clipart, used to decorate their arcade cabinet. Jeoff was kind enough to pass on the collection of arcade clipart he used in the creation of his cabinet - a combination of artwork from the net and work in Paint Shop Pro. Thanks Jeoff! From the Tron page! There's much more to see on their web site than what I've mirrored here! Cory Vigen created a MAME marquee for his arcade cabinet that looks sharp. You can preview it here. He's put a lot of work into it - thanks Cory! The Mean Green MAME site has a MAME marquee available for download that I've mirrored here. It's 12" by 24" and has little to no distortion. Richard Kirk also created an excellent MAME marquee for everyone to share. You can preview it here. From RIchard: "People always seem to ask too so I'll tell you how I printed it. Fortunately for me I work for a newspaper so I printed it to 4 film separations (CMYK) and then used a technique called croma proofing to print a full colour glossy image. Then I trimmed it up and stuck it between two pieces of plexiglass (already in my machine). Looks great with the backlit flouro. Any decent printing place should be able to print one of these out at the required size for no more than $50. Hope you like it." Thanks Richard! Manolo was kind enough to share his marquee with everyone. 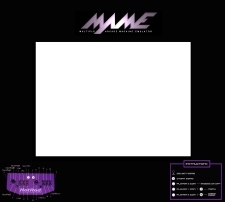 It's got the traditional MAME logo, but with a purple instead of blue tint, and various arcade manufacturer logos on the left and right sides. 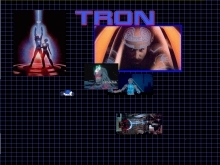 From the Tron page, a collection of wonderful eye candy that is going to find a home in my project. There's much more to see on their web site than what I've mirrored here! Windows 9x MAME startup/shutdown screens found on James Gamesroom's web site. 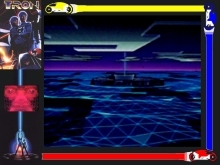 An anonymous Build-Your-Own'er scanned and created these startup/shutdown screens from TRON. c0nsumer passed on to us the templates he used to build his control panels. Thanks c0nsumer! Visio stencils in Visio 4 format for arcade controls - joysticks, buttons, etc. Useful for laying out prototypes for your control panel. All the parts in the stencil are 1/2 scale. Suggested use: Layout your panel at 1/2 size to fit easier on a single 8.5"x14" legal page. When you're ready to test it, print the drawing at 200%. This will result in a multi-page version of the drawing that can be taped together as a full-size mockup. Thanks for sharing Jack! Jason took the Visio stencils made by Jack, and adjusted them to be exact mechanical dimensions for typical Happ controls. Use these if you don't want to adjust the above ones to size. Thanks Jason! Atari 2600 Plus! theme for Windows 95/98. Requires MS-Plus option pack for Windows 95, built in support for Windows 98. Freeware/shareware third party programs exist to support themes if you are running Windows 95 without Plus. Bubble Bobble Plus! theme for Windows 95/98. Requires MS-Plus option pack for Windows 95, built in support for Windows 98. Freeware/shareware third party programs exist to support themes if you are running Windows 95 without Plus. Crazy Climber Plus! theme for Windows 95/98. Requires MS-Plus option pack for Windows 95, built in support for Windows 98. Freeware/shareware third party programs exist to support themes if you are running Windows 95 without Plus. Defender Plus! theme for Windows 95/98. Requires MS-Plus option pack for Windows 95, built in support for Windows 98. Freeware/shareware third party programs exist to support themes if you are running Windows 95 without Plus. Donkey Kong Plus! theme for Windows 95/98. Requires MS-Plus option pack for Windows 95, built in support for Windows 98. Freeware/shareware third party programs exist to support themes if you are running Windows 95 without Plus. Donkey Kong 3 Plus! theme for Windows 95/98. Requires MS-Plus option pack for Windows 95, built in support for Windows 98. Freeware/shareware third party programs exist to support themes if you are running Windows 95 without Plus. 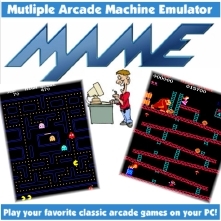 Multi Arcade Machine Emulator (MAME) Plus! theme for Windows 95/98. Requires MS-Plus option pack for Windows 95, built in support for Windows 98. Freeware/shareware third party programs exist to support themes if you are running Windows 95 without Plus. Nintendo Gameboy Plus! theme for Windows 95/98. Requires MS-Plus option pack for Windows 95, built in support for Windows 98. Freeware/shareware third party programs exist to support themes if you are running Windows 95 without Plus. Nintendo Mario Kart 64 Plus! theme for Windows 95/98. Requires MS-Plus option pack for Windows 95, built in support for Windows 98. Freeware/shareware third party programs exist to support themes if you are running Windows 95 without Plus. 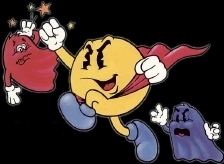 PacMan Plus! theme for Windows 95/98. Requires MS-Plus option pack for Windows 95, built in support for Windows 98. Freeware/shareware third party programs exist to support themes if you are running Windows 95 without Plus. This is a movie of a virtual arcade ending with an incredible view of a MAME arcade cabinet, with a Styx tune playing along. It darn near got me misty eyed, it's a great piece of work and has been added to my must-have for my cabinet. Now hosted here. Suggest you right-click and save the file or it will possibly open in your browser instead. 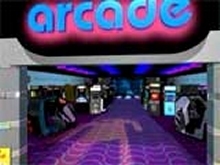 StarGoddess222 put together a Flash MAME movie running a slideshow of various arcade shots with "Hungry Like The Wolf" playing in the background. Available for download in both .exe and flash formats. Suggest either way you download it instead of streaming it in the browser.